Traditional craftsman styling and time-tested construction techniques give Yardistry’s line of gates both outstanding performance and visual elegance. 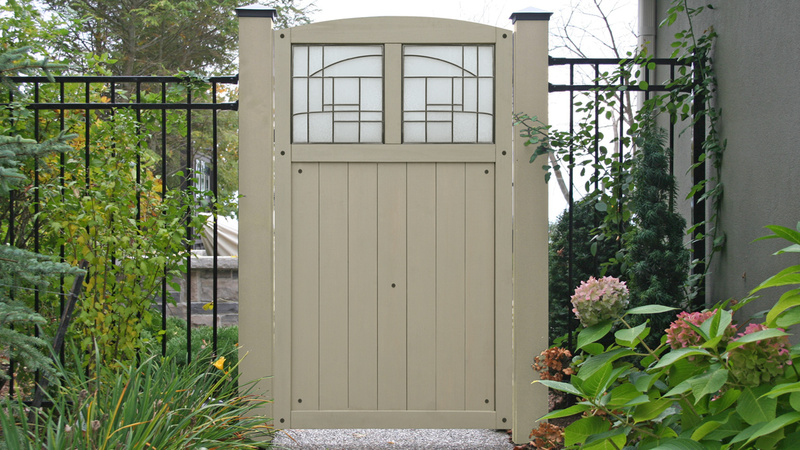 Like all Yardistry projects, the Grey Fence Gate with Faux Glass Inserts is crafted with exterior grade Cedar Lumber. With its natural beauty and outstanding physical properties, Cedar lumber is the preferred choice for outdoor projects and considered a premium material. The ability of Cedar to bring warmth and character to a backyard project just can’t be matched by plastic or other man-made materials. The factory-applied stain provides additional protection against the elements and coats the gate in a rich shade of tugboat brown which is accentuated by the elegant faux glass inserts. Overall Dimensions (H x W x D): 5ft. 9in. x 3ft. 6in. x 1 ½in.